So, I'm really having a blast playing around with the rules for Light City. I probably think about it a lot more than I should think about a not-even-half-formed supers setting and ruleset that's about the billionth such setting and ruleset to be developed. But man, is it fun to daydream about it! One of the things I've been trying to do with each class (which I'm sure is actually pretty obvious) is to look around at existing characters (and being a bit of a DC fanboy, especially those in that universe) and try to make sure that reasonable approximations could be statted up with the tools given. For the Amazon, there was really one key character I had in mind, of course (although I did want some variety to be possible). But for the Brawler and the Elemental, I had a number of characters in mind. I found it kind of interesting when I looked around the current DC universe and noticed that, other than all of the Lanterns that are currently getting a spotlight of one sort or another, there really aren't many "pure" Elemental types being showcased. Captain Atom may be working his way back into the limelight of the DCU, but he isn't there yet. Firestorm is a pretty big deal on TV, but...well, is he anywhere to be seen in DC Rebirth? Over in the Justice League of America, though, a couple of Elementals are making their presence known. 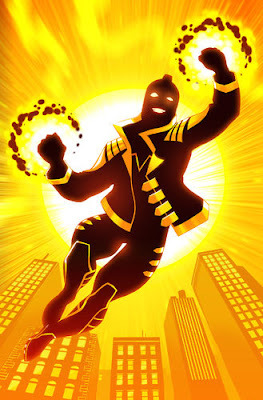 There's Killer Frost (building on her TV presence, I presume), and then there's this guy...the Ray! I've long thought he seemed like a cool character but, until the JLA appearance, had never really given him a good look. One of the things that I do like about him is that he clearly carries on a decidedly Golden Age tradition but doesn't seem out of place as a wholly modern character! You can check out the various versions of the Ray that have been created over the years over here at the DC wiki. Attack: Light Ray, +3 to hit, 1d6 light damage, range 60 ft.
Elemental Powers (6x/day): Construct, Light I, Photon Missile (a la Magic Missile). Next up, I think it's time I tackle a Sidekick...! He's a fun character. I'm glad he's getting attention. Now that I've seen more of him, I hope he sticks around once this version of the JLA inevitably runs its course.